The Brown Spots are unlikable for almost everyone, especially for women. It can be called as age spots which imply that it usually appears after a certain age like 50. It becomes worse and worse with age. Although it does not have a harmful effect on your body, it does make people ugly. As it is human nature to love beauty, lots of people do much work to get rid of the annoying brown spots. 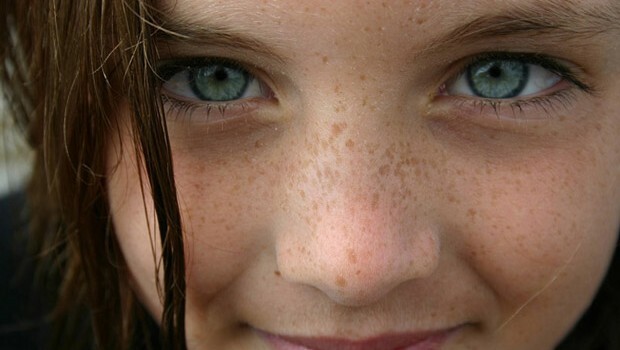 The primary cause of the appearance of brown spots is sun exposure. Some other factors also cannot be neglected, such as aging, pregnancy, stress as well as inappropriate skincare. So if you are a young lady, be careful and reduce sun exposure as much as possible. And if you are already suffering from the problem, never be depressed. You can deal with them by using some home remedies. The specific ways are introduced in the following part. Apply some vegetables like onions and apples. Chop the onion into pieces and wrap them with cheesecloth in order to squeeze out the juice. Then mix the juice with apple cider vinegar. Next you can enjoy your fruits of labor by putting the mixed juice on the spots. Keep it about 30 minutes. You should keep it as a daily routine and 6 weeks later, you will find the brown spots start to lighten. Lemon juice is effective as well. With its bleaching property, it can solve the brown spots. You just need to place some fresh lemon juice directly onto the spotted areas. Keep it 30 minutes and wash it off with cold water. If you want to see the positive effects, you should do it twice per day and keep the process at least 2 months. You can add some sugar or honey into the lemon juice which makes the effect much more obvious. Make a facial mask with rice grains and watermelon juice. Poke a hole on the watermelon rind and then pile some uncooked rice grains in the watermelon. Put the watermelon in tour refrigerator overnight. Next day, you need to open the rind and scoop out the plumed rice. Then you can start to make your mask by using the rice grains. Apply it to your face and wash it off after 15 minutes. Use buttermilk. The lactic acid in buttermilk is highly beneficial to our health. In fact, you need to make sure that you drink at least a cup of buttermilk every day. As for brown spots, you can dab some buttermilk onto the affected area. Sooner or later, you will find the Brown Spot start to fade. Tomato juice is optional which can reduce the dark spots. Fade cream is also helpful. Buy some fade cream which has hydroquinone, an effective skin lightening agent. You can benefit a lot from the fade cream. As a kind of over-the-counter medicine, you should be very careful. And ask your dermatologist for help when needed. Aloe Vera is also a good choice if you want to get rid of brown spots. Like lemon juice, you simply place the fresh aloe vera on the spots and remove it with cold water after about a half hour. You should repeat the work twice a day and in a month, you will notice the positive effects. Drinking it per day will give you a healthy and beautiful skin. Different ways are suitable for different people. So you need to find the most effective way by yourself. We can never guarantee that every remedy works for everyone. It is a long-term process. If you give it up after several days, you can never reach your ideal results. Keep it several months if you can. You can also try some expensive medical procedures if they are affordable for you, such as a microdermabrasion session and laser resurfacing. Their effects are quite obvious and they take less time.